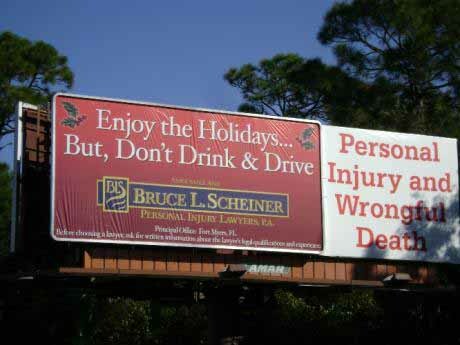 The staff and attorneys for victims of drunk driving crashes at Associates and Bruce L. Scheiner, Personal Injury Lawyers, wish everyone a joyous New Year’s holiday and want to remind drivers of the message on dozens of the firm’s billboards throughout Southwest Florida: Enjoy the Holidays but Don’t Drink and Drive. Law enforcement throughout the region will be out in force and there will be zero tolerance and no excuses as authorities seek to reduce the 20 fatal drunk driving crashes that occurred on Florida roads last year. Mothers Against Drunk Driving estimates the cost of a drunk driving arrest at $8,000 to $11,000, including fines, attorney fees and increases in auto insurance premiums. Statistics from the Florida Department of Highway Safety and Motor Vehicles show 38 people died on Florida roads during last year’s five-day New Year’s Holiday. Twenty died in alcohol-related fatalities – a 33 percent increase over an average five-day stretch. About three people die on any given day in Florida as a result of an alcohol related traffic crash. Officer Shawn Yates, of the Fort Myers Police Department said city officers also will be out in force and are cooperating with the Cape Coral Police and the Lee County Sheriff on a sobriety checkpoint at an undisclosed location to educate drivers and remove drunk drivers from the roads. Charlotte County Sheriff John Davenport announced there will be saturation DUI patrols out New Years Eve and New Years Day looking for impaired drivers. Deputies will be out in force to prevent drunk driving crashes throughout the county, including Punta Gorda, North Port and Port Charlotte. “Extra patrol units of the Traffic Safety Team and road patrol deputies will be watching for those who may drink and drive, or use drugs and drive,” department spokesman Bob Carpenter said. Sheehan urges people throwing parties to prevent underage drinking, offer a non-alcoholic alternative and provide plenty of high-protein snacks. And people need to be aware that beer and wine are just as intoxicating as hard liquor. Those who suspect a drunk driver is on the road are permitted to call 911 to tip authorities, Sheehan said. In the unfortunate event that you or someone you love is involved in a crash, there are certain things you can do to help protect your rights. The attorneys representing victims of car accidents and drunk driving crashes at Associates and Bruce L. Scheiner, Personal Injury Lawyers, offer free appointments to discuss your rights at any of the firm’s offices in Fort Myers, Cape Coral, Naples, Port Charlotte, Arcadia, Sebring and Venice.